On an unusually wintry spring morning we travelled to Martin for the tour day weekend held at Kaarakin, a West Australian Black Cockatoo conservation centre. If you’ve followed my instagram account you may have noticed a couple of photos of a largish black bird. This is because a flock of Forest Red tailed Black-Cockatoos have taken a keen liking to the Cape Lilac tree in the backyard. Watching their daily comings and goings over a period of four months has been entertaining turned exciting when we spotted a juvenile in the flock. Eventually they stripped all of the seeds from the tree and having no intentions at making a friendship with us they moved on. 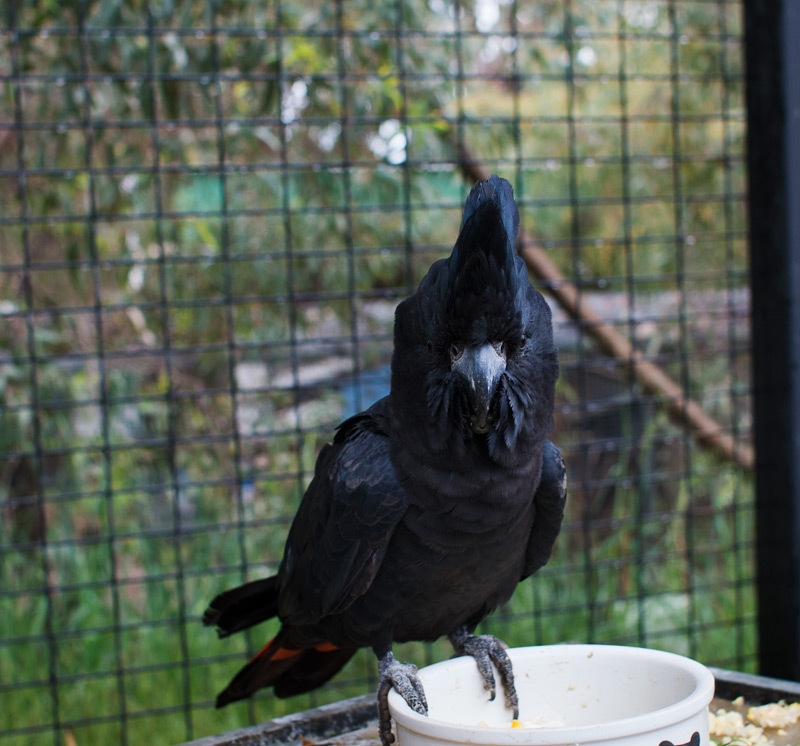 A fact that may surprise some including myself is there are three species of the Black Cockatoo unique to south west Western Australia – Carnaby’s Black-Cockatoo, Baudin’s Black-Cockatoo and the Forest Red-tailed-Cockatoo. The tour took us through the park, past resident animals of kangaroos, emus and peacocks, a legacy of the old Cohunu Park which has now moved to Byford. As it turned out the animals were too big to be transported and home is now at Kaarakin. A group of dedicated volunteers have been working since Kaarakin opened on the site years ago to transform the park into more of a natural habitat for the animals. 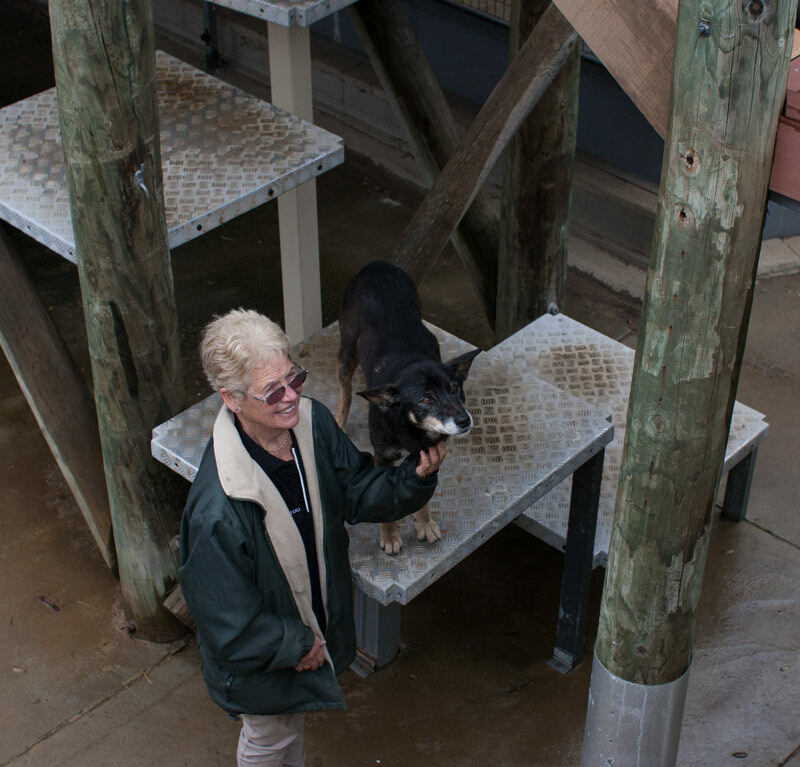 The old wombat concrete enclosure was a sad sight and as were the bird cages, a sign of past mind sets focused on human entertainment over conservation and protection of animals. Thank goodness that is long gone in this area! We spend a few moments at the pond listening to the surrounding animal noises and nearby frogs, wouldn’t that be nice to experience at home everyday? Interestingly Kaarakin utilises reeds as a natural self cleaning mechanism for the pond. 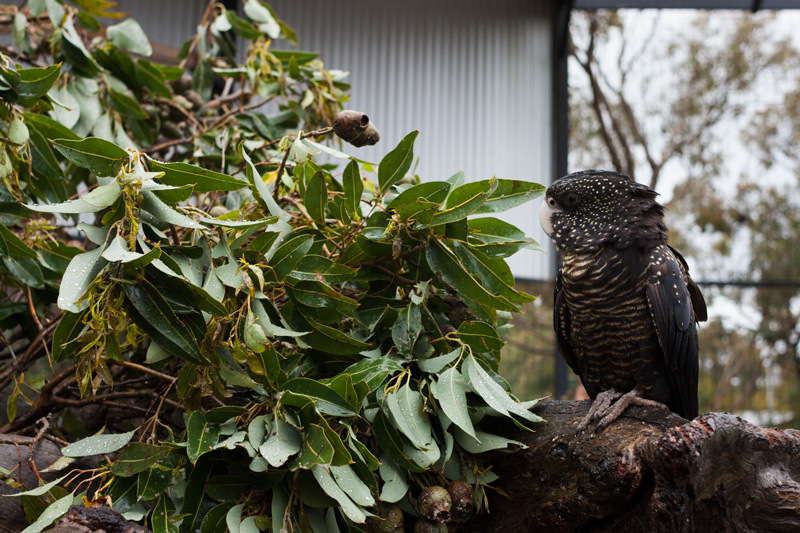 We stop past several native trees that the Black Cockatoos like to feed off. It’s great to learn the visible differences between the marri, jarrah and sheoak trees. 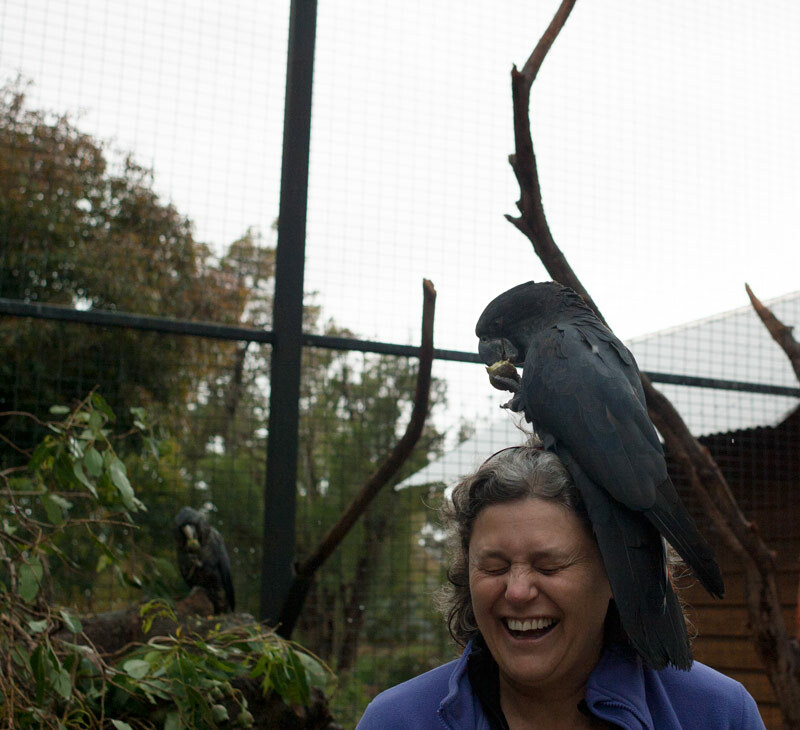 Kaarakin is a not for profit organisation working for the rehabilitation and conservation of the Black Cockatoos. 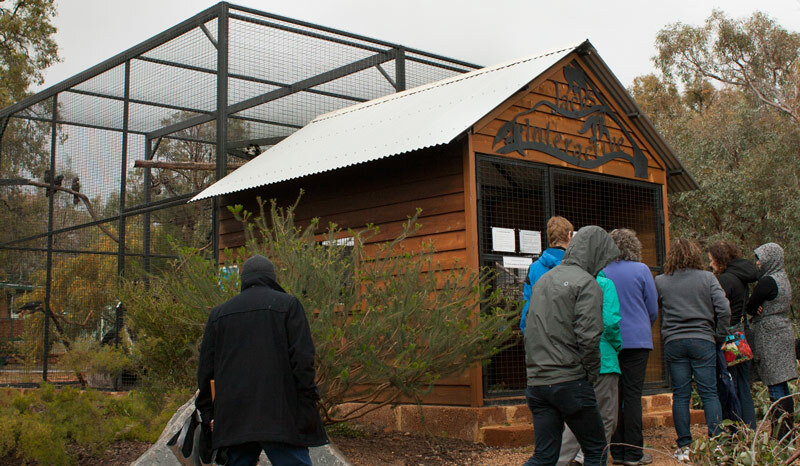 During the tour we pass by two large enclosures, one housing cockatoos that will be released back into the wild and the other where the cockatoos are unable to be released due to their sustained injuries. In this enclosure human interaction is tolerated however those deemed okay for future release have very limited human interaction to aid their overall chances of survival. 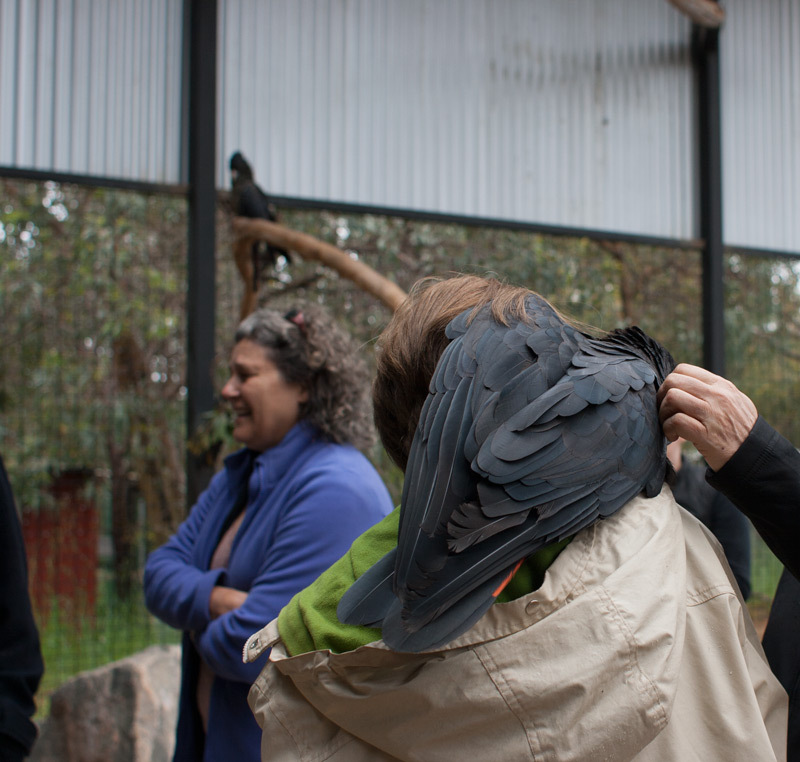 We are shown a 64 metre long enclosure where the birds can strengthen their flight muscles. Unfortunately my camera didn’t capture the flock flying by nor the sounds of ‘karak’ or ‘weeoooweeoo’ or ‘wa wee lah’. 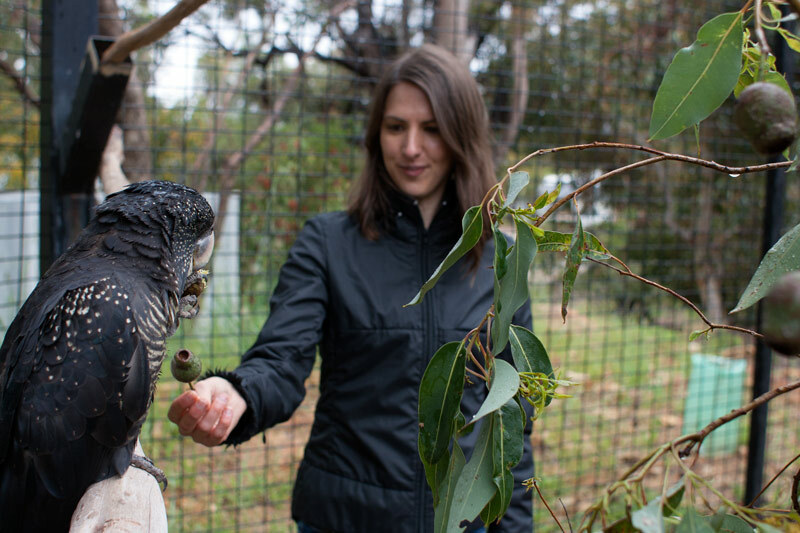 Kaarakin’s small army of volunteers and part time staff members partner with institutes like Murdoch University, Perth Zoo and the Department of Parks and Wildlife. To call their work amazing is an understatement – it’s legendary. 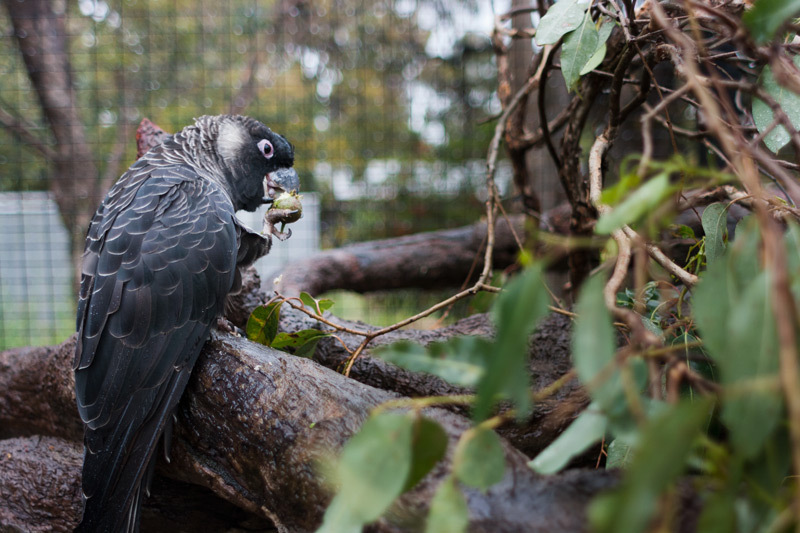 The very last stop on the tour is the interactive aviary where we’d be able to get up close to the birds and as we later realised, this was definitely our favourite part of the tour. There were a series of question checks and spraying of shoe soles in the best interests of the birds before we entered. Being the first tour for the day, the birds were excitably active and a few gathered close by. Now if you’ve experienced the loud calls of these birds in the forest let me say up close the piercing noise is something you must witness! Especially being surrounded by half a dozen chatty birds. 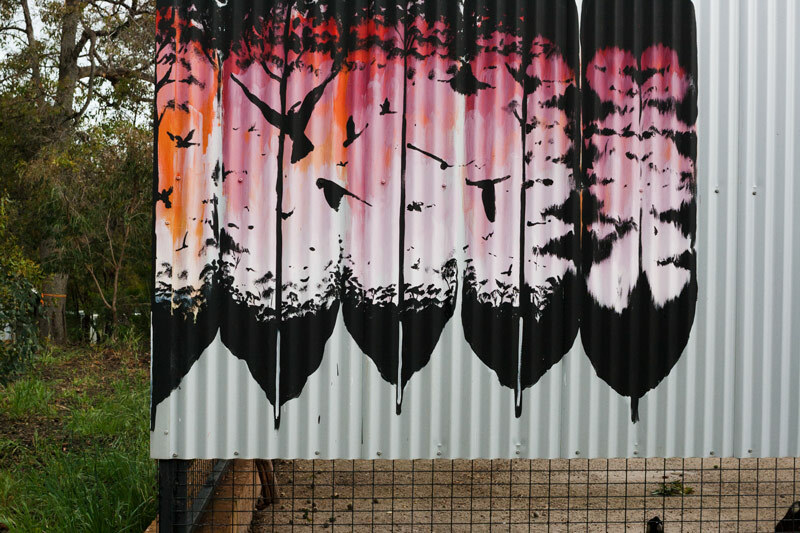 The birds within the interactive enclosure are fairly tame and as we walk in a few fly above us, others continue feeding and one decides to land on a ladies head! It was remarkable to see the appearance of these birds up close, their feather colours, the way they ate, their claws and bills. 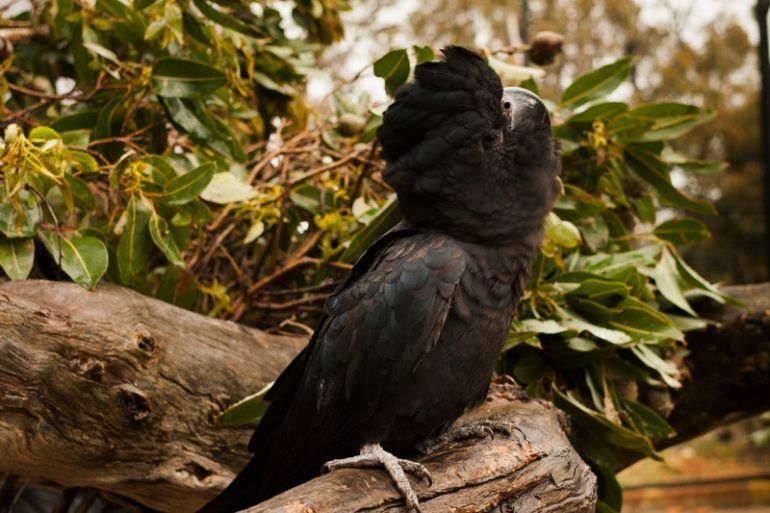 In the wild this is virtually impossible and if you see a Black Cockatoo on the ground it more than likely means it is sick or injured. The strong powerful bill of the Black Cockatoo is capable of extracting the seed found in a eucalyptus nut, its favoured food source. Interestingly each of the three species attacks the nut differently. We learnt by inspecting the discarded nuts on the forest floor we can identify which Black Cockatoo has been around the area. This is knowledge any nature lover will get excited about and yes I too was a little excited at the prospect of using this whilst on the trails in Western Australia! 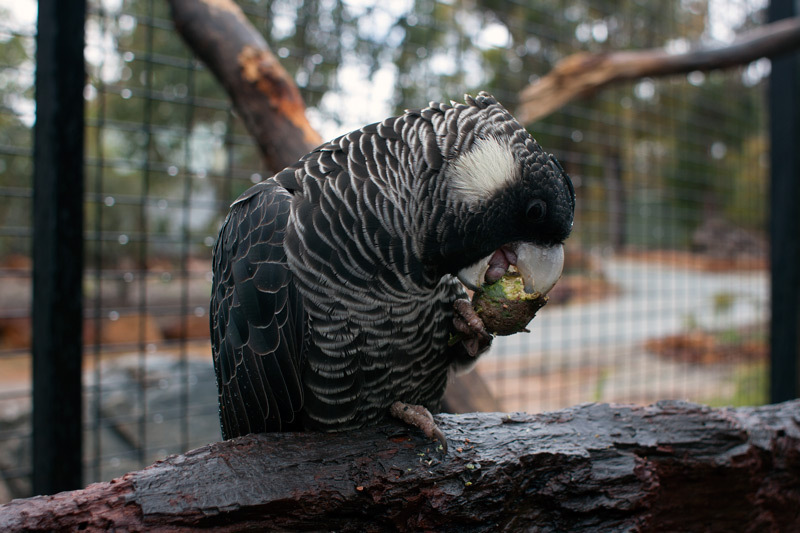 The Carnaby’s Black-Cockatoo (pictured below) chews off the top of the nut. The Baudin’s Black-Cockatoo has a longer and narrow bill with the ability to almost surgically extract the nut. The Forest Red tailed Black-Cockatoo, well, it makes a mess of the nut. While the Baudin and Carnaby look very similar with white markings and are each identified by their bills, the Forest Red tailed is differentiated by the red colour on the tail and it’s call is a sharp boisterous ‘karak’. The female and male forest red tailed are further distinguished with the male being black all over and a red colouring on the tail. The female has beautiful yellowish and pale orange specks as pictured below. 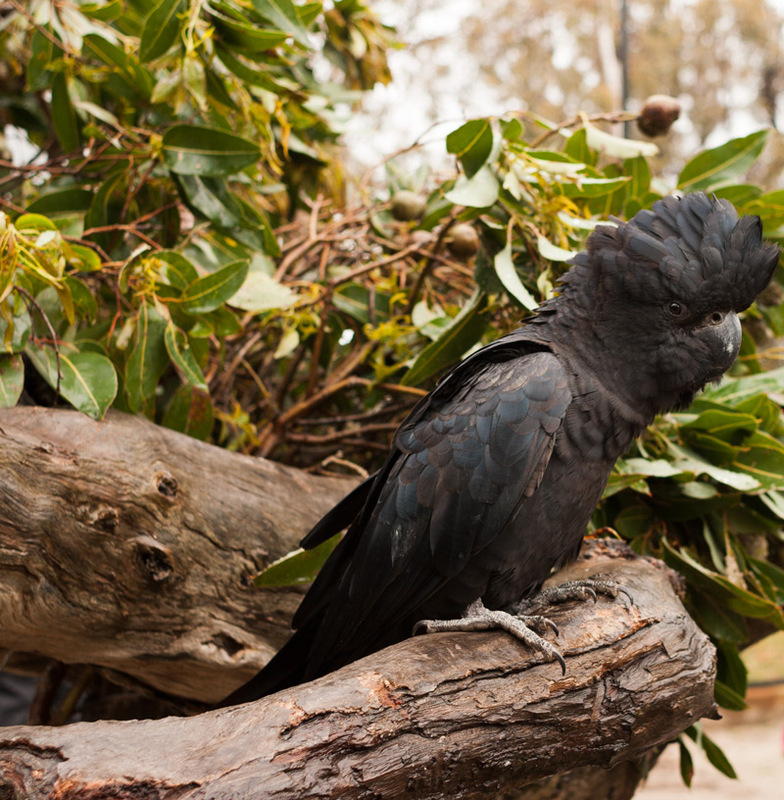 The Forest Red tailed Black-Cockatoo is also the smallest of the three species and we able to see this in the enclosure during the tour. Have you ever seen a Black-Cockatoo cuddle, well you are about too- this male Forest Red tailed Black-Cockatoo had wrapped his wing around in an adorable show of affection to one of the staff members. The juvenile pictured below was inquisitive but not quite willing to be persuaded to perch on either one of us. All the same his chants and head shakes in peacock fashion were very entertaining. Derek replicated the same to which the juvenile curiously put one claw on his arm and took it off several times. Flocks of Carnaby’s Black-Cockatoos and Baudin’s Black-Cockatoos are becoming less of a common sight around the place and recent research from Birdlife Australia indicated these guys could be no longer in the Perth/Peel region by 2029 at the current 15% per year rate of decline. While it’s wonderful to see these birds in my backyard, the reality is the Cape Lilac tree they feed off is an introduced exotic tree and at this stage there is little known about the long term effects to the birds. Also the new backyard visitors is a an indication they are losing their native forest and moving into urban areas to source food and suitable nests. We could also says it’s fantastic they are learning to adapt but we can’t let this lead us into thinking it’s okay to remove large pockets of their true habitat. Loss of their regular stomping grounds through forest clearing or fire affects breeding habits missing crucial opportunities to breed from one year to the next. To put the breeding issues into perspective, it takes 80 plus years for a tree to develop a hollow suitable for the birds to nest. Raven attacks and nest competition from other animals including the introduced European bees are also ongoing threats. The good news though, is that artificial hollows are proving very successful in supporting the breeding of these birds and rehabilitated birds released are being taken in by wild flocks. The future is hopeful because of these conservation efforts. Visiting a conservation place and seeing the issues first hand, the question arises how can I help? I want to help! 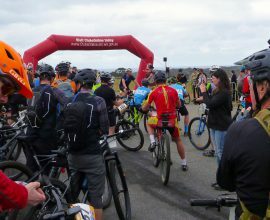 For starters my belief is that we can be more connected to the environment around us and spread the word as a community. See an injured bird, ring Kaarakin or DPAW’s wildlife 24 hour hotline. Ask for for native trees to be planted in parks and reserves. Did you know native trees attract an interesting wildlife that can often be very entertaining to watch? 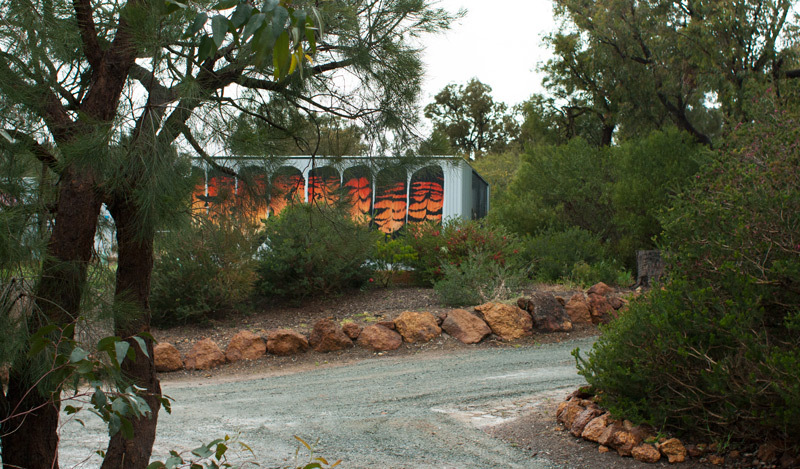 Donate or book in for a private tour at Kaarakin where monies go straight back into Kaarakin. Go for a walk and appreciate the birds when you hear and see them. Teach the younger generation how special it is to have wildlife around. Remind everyone else there is an abundance of wildlife special to Western Australia and worth caring about. 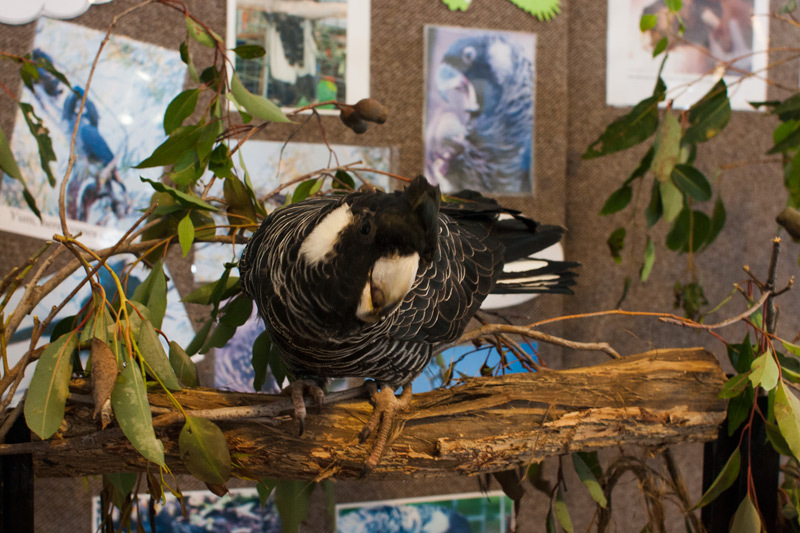 Kaarakin also run educational workshops and this Carnaby’s Black-Cockatoo pictured below is somewhat of a travelling education ambassador. If you know a school teacher, why not quietly suggest whilst not sounding like you are telling them how to do their job to incorporate a wildlife workshop into the curriculum? Another face for Kaarakin is the dingo enclosure, home to the pure blood line Pilbara dingoes and also the alpine dingoes from the Eastern States of Australia. The alpine dingoes appeared on leads with handlers a number of times during the tour. 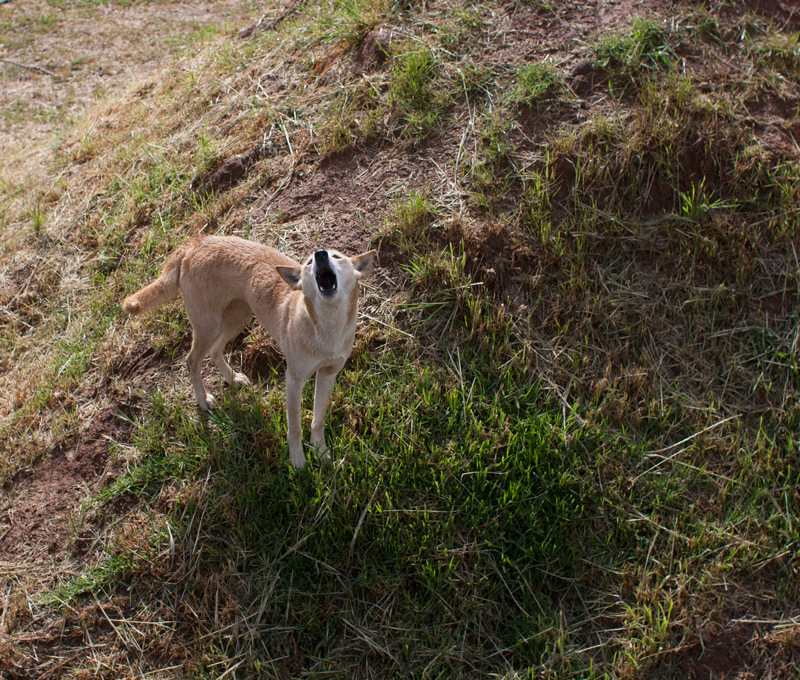 As we viewed the Pilbara dingoes from a platform, one of them began to howl and it appeared to have picked up a German Shepard accent by barking randomly in between. The Pilbara dingo can also have a dark coloured coat as pictured below. It was curious to see how they flatten their ears, very different to domestic dogs. The tour was incredibly informative and lot’s of fun, it was also a very different way to spend a Saturday morning. Being able to observe the birds up close gave us more of an appreciation that we still have them around. 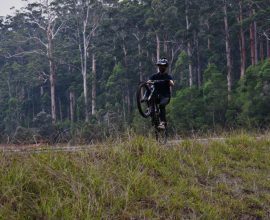 We’ve seen them mountain biking along the Munda Biddi trail in Mundaring and in Kalamunda. I’m sure you could also see them along the Bibbulmun track or any of the hiking trails in a jarrah forest.